Gymfed presents it's Kid's Gymnastics Programme! Looking for a gymnastics programme for kids? 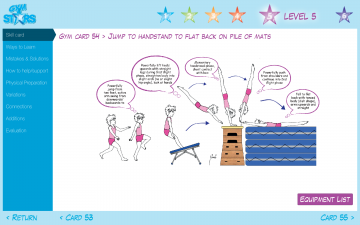 Gymstars is a complete didactical and methodical programme for trainers of recreational gymnastics in clubs and schools. It has children "shine" according to their own capacities and desires. The Gymstars programme is composed of 6 movement themes and 6 levels of difficulty. It includes 66 movement skills (skill cards) and up to 1200 exercises (ways to learn, variations, additions,...). This makes Gymstars the ideal trainer’s tool for an effective and exciting gym class. A must-have for a FUNtastic gym class! Download the Gymstars-app for your tablet in the App Store or Google play for only € 19,99! More info? Contact Lore Marguillier.